It’s salad season, everyone! 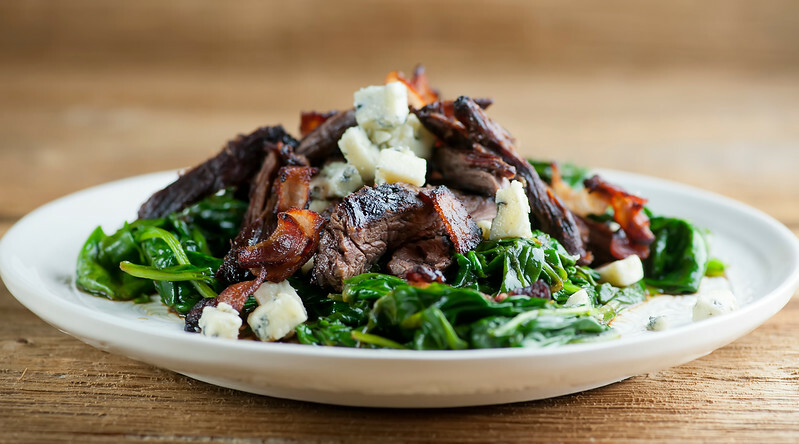 This recipe for balsamic blue cheese steak salad is full of the rich flavors of beef, cheese, bacon and spinach, finished with a splash of balsamic vinegar! Hello, salad season! We are now smack into the lazy, hazy days of summer, and so I have salads on repeat in our kitchen. And while I love a good fruit and veggie salad as much as the next girl, salad for supper sometimes means you want a hearty dose of protein along with your greens. In this case, some sliced steak with a good scattering of blue cheese on a bed of spinach that has been zinged up with some balsamic vinegar. Oh, and did I mention it has bacon? You are in, right? Let’s make it! Meantime, after decades of being purely a wine-loving person when it comes to having a beverage with my salad, for unknown reasons I have started trying out some of the summer cocktails at our local watering holes. 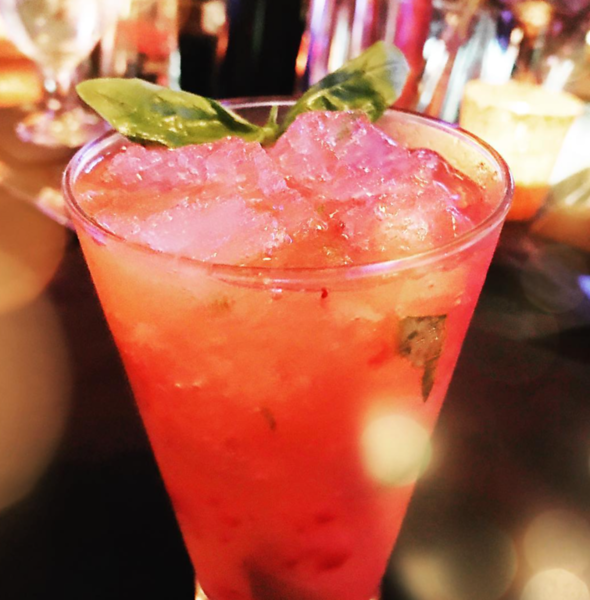 For example, check out this strawberry basil margarita I had the other night. Meantime back at the salad, this is one of those suppers that comes together in two shakes in one skillet. Start by cooking up the bacon, and then scoop it out and let it drain. Sear the steak in the bacon drippings – one or two minutes a side is usually all you need for a thin skirt or hangar steak. Now add a little butter to the bacon and steak drippings (see how glorious this is getting??) and saute up the spinach. When it is wilted, toss it with a little balsamic vinegar, and then divide it among a couple plates. Slice up the steak, pop it on top of the spinach and scatter some blue cheese on top along with the bacon. Hello, you gorgeous plate of balsamic blue cheese steak salad, you. Cook bacon in a large deep skillet over medium high heat until crisp. Remove with slotted spoon and drain on paper towels, leaving drippings in the skillet. Raise heat to high and add steak, cooking for 1-2 minutes per side depending on thickness for medium rare. Remove steak and let it rest while you cook the spinach. Add butter to skillet and saute spinach until wilted. Stir in balsamic vinegar and toss until mixed in. Slice steak. 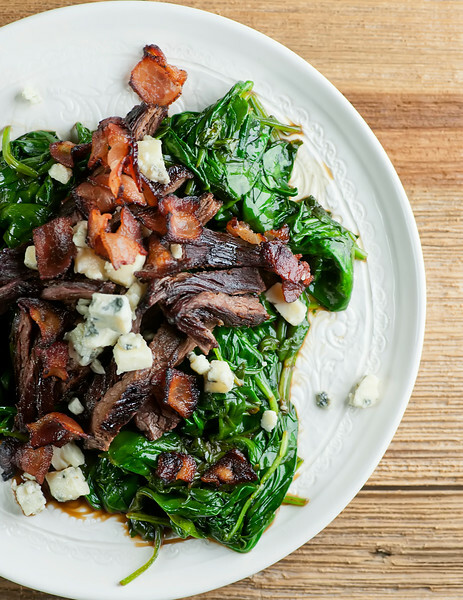 Divide spinach between two plates, top with steak, bacon and blue cheese and serve! Beautiful photos! This recipe sounds so rich and delicious, love the use of bleu cheese and steak to turn a salad into a meal.Tasty! Drooling over this at 8am Kate! Need to try ASAP! I think you will LOVE this one, Mary Ann! Perfect beach eating! Oh, man, does this look good. I love a good steak salad. I’ve never served one on a bed of wilted spinach- this is going into the mental rolodex for future reference. Our favorite steak salad has a zingy balsamic dressing, and also balsamic marinated strawberries. Divine. Savannah! First, I need to tell you that we ALMOST named our daughter Savannah – it’s one of my favorite names. :) Second, your favorite steak salad definitely sounds like something I need to try! I often have salad for dinner during the summer. It is usually the run-of-the-mill garden style. This steak salad what I need to add to my repertoire. It looks amazing and frankly so much more flavorful than my go-to! Salad for dinner is the best, but yes, it needs to be hearty! Hope you love this one as much as we do.